Catherine Wilks, CEO Designs In Mind, talks of how her social enterprise is empowering people with mental health issues by offering them meaningful and creative jobs. When City Matters asked me to pen a few words on where Designs In Mind sits in the sector, and what the opportunities for our social enterprise are going forward, I have to confess I have no idea! Am I allowed to say that? The truth is we are still figuring all this out. Sometimes it feels like we are in a world of our own, and sometimes like we are part of something much bigger. 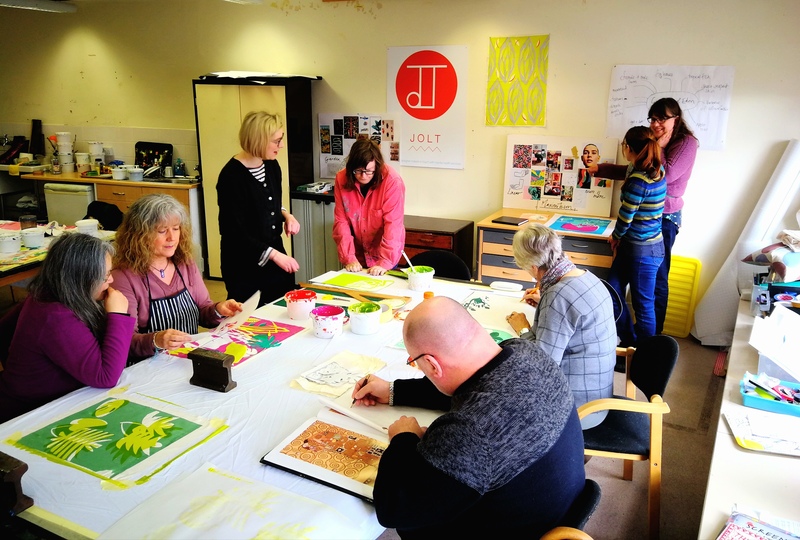 Designs in Mind is a working studio where adults living with mental health challenges join as a member of the team, making and designing commissioned artwork and products. Through our retail brand – JOLT – we are commissioned to create designs for our partners and have an online shop as well as a bricks and mortar site in Oswestry, Shropshire. JOLT sells the work we make, enabling members to take on new roles and responsibilities, thus making stories, lives and mental health more visible. It also enables local people to take the first step in to mental health support without fear, judgment or stigma. Our work is intensive and supports people as individuals, recognising the recovery path they each take is different. For most of our members, we see the transition from only coming out of the house to visit the studio to doing their own shopping, meeting children from school, joining other groups, volunteering, or going back to work. In terms of mental health, it feels like we are now being recognised for challenging the culture of low expectation that surrounds people living with mental illness. It feels like we are challenging how mental health ‘services’ are accessed and provided, and it feels like we are figuring out a better relationship between people and processes that means, together, we are finding ways to live life. Over the years, and with continual negotiation, we have secured a useful amount of financial support from our Clinical Commissioning Group, which gives us a stake in the statutory mental health debate within our region. However, for all of the above, we are not perfect, instead on a messy journey with lots of ups and downs. Our opportunities are within the people who make up our team, and the rural community in which we work. Other opportunities are in the growing reputation we are building for high quality and unique design for textiles, packaging, homeware and gifts – the fact that our design also has a story and a social impact is a bonus. In terms of social enterprise, it feels very exciting to be part of a movement that is challenging the traditional world of business and inspiring people to think about what happens to their money when they spend it. Earning our own income through ambitious commissioned artwork and products for retail has an impact on our collective and individual sense of self-worth and purpose. It is unrestricted income, so as a team we can be responsible for how it is spent, being proactive and responding at the right time when support is needed. It also contributes to the sustainability of our studio which, in a time when grant funding is limited, is essential. We are on the brink of a massive change, working towards a more effective business model, selling designs as well as things, working with commercial partners to widen our reach, and working collaboratively with other producers. Our work makes people say ‘wow’, and we strive to exceed expectations. In turn, people living with mental health challenges have a different platform from which to take on the world.